Communications on the Internet started out as simple email conversations. Then came social media, offering new ways of interaction among people from across the world. Email is still the primary mode of professional communication. Yet, over the course of time, one does look for building up (both personal and professional) connections with other people, on social media as well. Say you have a business email contact, with whom you wish to connect on social media. He or she could be an active user on Twitter, LinkedIn, Facebook or even Google Plus. How do you find out your contact’s social profiles from that? Of course, the easiest way is to just ask. But “asking” might not be convenient in every situation. Or, maybe you just want to check out a sender’s social profiles before taking any further action. In which case, you have to manually search them on the Internet and also validate whether those social profiles you find are genuine or not. Well, there’s an easier and more definitive way to find out. Most people have a primary email address, which is used to sign up on all the social networking sites. And thus, in a way, that one email address links all the respective social profile. Taking advantage of this fact, ManyContacts is an online service that reveals respective social connections based on the email address provided. It is also available in the form of a Chrome extension, and works with Gmail, Google Apps, and other email providers as well. Once the extension is installed, tapping on the ManyContacts icon from the top right corner in Chrome reveals a list of email addresses present on a particular web page, along with their respective social connections. On Gmail, hovering over an email in your Inbox reveals the social media connections associated with that email address. On LinkedIn, it reveals additional information about the contact’s online profiles, such as Twitter, Facebook, Google Plus, associated websites, emails, phone numbers and more. 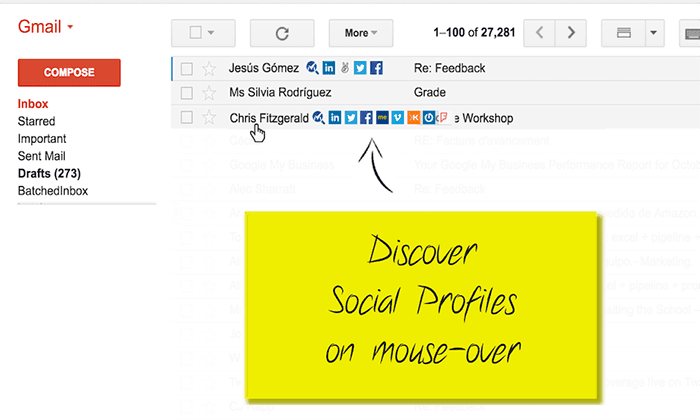 Clicking on any of the social media icons (revealed alongside a particular email address) takes you directly to the contact’s corresponding social profile, where you can connect with them directly. You can also download the contact information in CSV format or store it in your ManyContacts account. ManyContacts Chrome extension is available for free on the Chrome Web Store. You’d need Google Chrome or a Chromium based browser to use it. Let us know of your opinions on ManyContacts in the comments below.